Skutt Studio Kilns are the most popular among serious home glass fusers. Their economical price coupled with large firing chambers make them flexible and affordable. Featuring top and side firing elements, these units fire very evenly across the shelf and also top to bottom. Features of the GM-1014 include the GlassMaster Controller, lid and side-fired elements, and a low mass Type K thermocouple. The lid has been redesigned to remove the pins that previously held the elements in place. This improved design eliminates the potential of pins falling into fused glass pieces. An 8" stand, hinged control box, and porcelain peep plugs are also included. Model GM1014 — The round shaped Model GM1014 has chamber dimensions 23½" × 13½". Fire to a maximum temperature of 1800°F. Shipping weight is 174 lb. 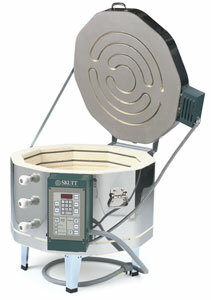 Furniture Kit for GM1014 Kiln — This kit includes one 19½" full shelf and four 5" posts. Shipping weight is 25 lb.